Here we are, at the end of the current semester of Chinese Cooking with Uncle Woody. Our last dish is going to be a simple, simple vegetable but one that you’ll want to make all the time, whether you’re having a Chinese banquet or not. 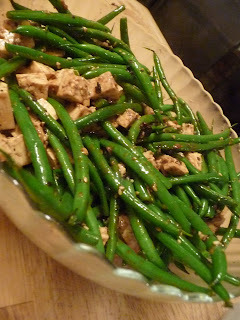 Stir-fried green beans and tofu with black bean sauce and sesame seeds. We blanched the beans, to keep them green but also to make sure they’re cooked all the way through. Cube the tofu. Toss them all in a hot wok with a Tbsp of peanut oil. When the beans are cooked to your liking, and hopefully have some nice charred spots, add in some prepared black bean sauce. This is a good brand. 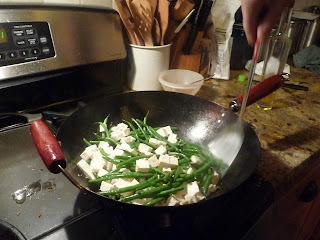 Stir fry another quick minute, then add some sesame seeds for a little flavor and texture. Blanch green beans briefly and shock in ice water. Heat wok on high and add a Tbsp or so of peanut oil. Let beans cook so that they get a few browned spots, but are not overcooked. 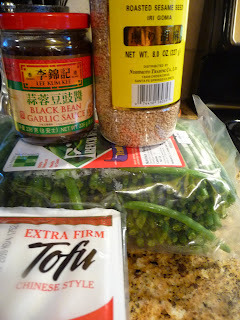 Add in black bean sauce to your taste--add a small amount at a time. I like a nice spoonful. Toss in a small handful of toasted sesame seeds. Previous post: Nana Recipe Wednesday–Beer Bread!